Glass table tops don’t just add to the aesthetics of your furniture; it can also help protect the wood from external elements. Also, glass also shows the table top. But why should you choose a tempered glass instead of a normal one? Tempered glass table tops are stronger than annealed glass. 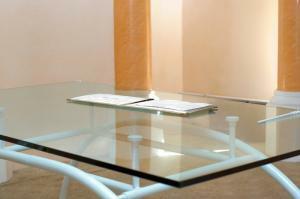 It means these types of glass materials can provide better and longer protection for your furniture. They don’t crack nor get scratches easily which could keep its life longer. This type of material is shatter-proof. While it does break apart especially with extreme force, it does not shatter and scatters into a thousand pieces that makes it harder to clean and dangerous. Standard glass tends to break apart into larger and much sharper pieces. Meanwhile, tempered glass shatters into dull, small pieces and often stays in one piece. Tempered glass materials are often shock-proof. While these aren’t entirely unbreakable, it gives you peace of mind that it won’t easily break when someone hits it a little too hard. However, it does crack when you put too much force on it, or it drops down so still, be a bit careful when handling it. It looks exactly like a glass tabletop, except it’s better. Tempered glass doesn’t have much difference with an annealed glass so if you’re worried about aesthetics, don’t be. The treatment may have been different, but tempered glass also has great transparency.